https://sep.yimg.com/ay/yhst-33477391359232/passer-angelfish-holacanthus-passer-passer-angel-fish-10.jpgPasser Angelfish - Holacanthus passer - Passer Angel Fish ModerateSemi-aggressive100 Gallon14.2 inchesYes, with CautionOmnivore, Greens, Pellet, FlakeTropical Eastern PacificPomacanthidaeSmall 2" - 3"
The adult Passer Angelfish has a dark blue gray coloration with one narrow vertical white band behind the gill covers. The Passer Angelfish has yellow-orange caudal and pectoral fins. In stark contrast, juvenile Passer Angelfish are multicolored, with a series of vertical stripes, yellow, narrow blue, brown through the eye, narrow blue, broad orange, white, and then five dark brown separated by narrow blue lines. The body of the Passer Angelfish has a narrow circular blue line. These markings make the Passer Angelfish a very easy species to identify, with the possible exceptions being the Clarion Anglefish, Holacanthus clarionensis (only found at the Revillagigedo Islands and Cabo Pulmo and is a bright yellow orange with is blue and brown aft of the gill covers with yellow pelvic fins; the juveniles are quite similar to the Passer Angelfish with the exception that the blue markings are black); and the Cortez Angelfish, Pomacanthus zonipectus (vertical stripes that are broad yellow, black, yellow, black, broad grey and black and a pale caudal fin). 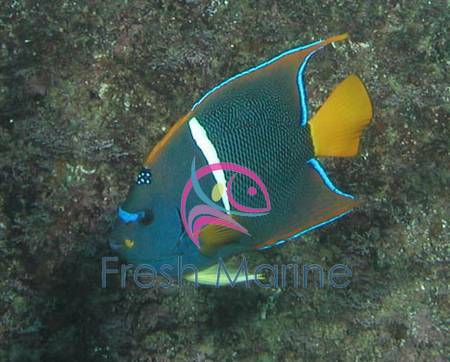 The Passer Angelfish is a member of the Pomacanthidae or Angelfish Family, known in Mexico as Peces �ngel. The Angelfish are reef fishes that are among the most colorful tropical reef fishes in the world. They are characterized by a strong conspicuous stout spine originating at the lower cheek. Young angelfish undergo radical coloration changes as they mature. They are grazers and pickers that consume small organisms including slow-moving algae, coral polyps, hydroids, sponges, tunicates and worms. Their mode of feeding predisposes them to be cleaners, which pick parasites from other fishes. Globally, 74 species of Angelfish have been identified of which only three live in the Sea of Cortez. The Passer Angelfish is abundant but only in certain parts of the Sea of Cortez, and it reaches 18 inches in length. The Passer Angelfish can be found in an around rocky coral reefs at depths up to 200 feet in the water column. It feeds primarily on plankton and sponges. In Mexico, the Passer Anglefish is found only in the lower two-thirds of the Sea of Cortez, and along the coast of the mainland south to Guatemala. The Passer Angelfish appears to be absent from around the oceanic islands. The Passer Anglefish is of most interest to scuba divers and is of virtually no interest as a sport fish. Recommended Tank Size: It requires at least a 100 gallon aquarium. Range and Habitat The range of the Passer angelfish includes the central Gulf of California, Guadalupe Island, south on the outer coast to Ecuador. They are common around shallow rocky and coral reefs from 3 meters (10 feet) to depths of at least 80 meters (260 feet). Juveniles can be found in shallower water. Specific Care Information: Temperatures for Passer Angels should remain between 75 and 78 degrees Fahrenheit (24 to 26 degrees Celsius). The pH value should be 8.3 or 8.4, with a specific gravity of 1.020 or 1.025. In an aquarium with invertebrates, the specific gravity should remain between 1.023 and 1.025; however, a fish kept by itself may thrive in the lower values of this range. It is important to keep a Passer Angel's water quality high, and to offer it plenty of hiding places. Passer Angels normally do not tolerate other Angels, and may nip at tridacnid clams, hard coral polyps, and soft coral polyps. In captivity, Passer Angels should be fed a variety of materials. Squid, mussels, spinach, and shrimp are commonly offered. Many will also graze on algae. Diet: Feed a varied diet consisting of large chunks of meaty foods. These foods include krill, raw table shrimp, squid, clam and mussel. It is also a good idea to occasionally supplement with some type of herbivore diet containing spirulina and supplement with a sponge fortified formula specifically for Angelfish. Breeding and Propagation: As with most angels, Passer Angels are not bred in captivity.